I just finished a great school visit. Driving home, I realized there were some keys to making it great. It’s essential to communicate with the venue effectively right from the first contact through the actual event. I try to respond within 24 hours to requests for school visits, weekend retreats, speaking at conferences, or any other speaking requests. I’m often asked how many times a year I do events. Basically, I try accommodate requests as often as I can. So, if I’m asked, I usually go. What type of event is being planned? How can my participation add to, complement or enhance the event? Type, length and content of presentation? Type of audience (grade levels, reading levels, adult, etc.)? Preferred date and alternate dates? Clear expectations result from clear communication and is the backbone of a great event. Providing materials for advance preparation. 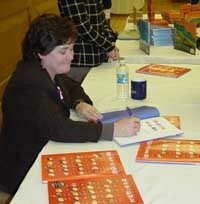 School author visits are most successful when students are prepared. I provide a free downloadable pdf file of lesson plans for all my books, which helps teachers introduce my books. For adult presentations, it’s often necessary to send bios, descriptions of presentations, and suggested copy to advertise the event when appropriate. Oliver is available to visit your school. 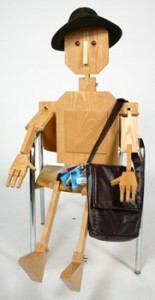 For those in Arkansas, I have available a four-foot wooden man, Oliver K. Woodman, who can visit your school. Outside Arkansas, you can rent an Oliver to visit your area. Another area of preparation is providing order forms, so books can be purchased at the event. I have a pdf file that I modify to fit the needs of the event. For example, I often give discounts to books bought when I speak and I adjust this as needed. Speaking is great fun. I’ve had whirlwind events! And I’ve met fascinating people in CA, LA (Louisiana, not Los Angeles), WA (Washington state, not D.C.), and many other places around the US. The day before my school visit this week, I checked my bag to make sure everything was there. Well, let me back up. I keep a bag packed with things I’ll likely need at a school event: foldable wire frame to hold a book upright; copy of book inter-leaved with overhead projector sheets for each page (back-up only these days); CD burned with Powerpoints of each of my books (MOST useful); a miniature Oliver K. Woodman, samples of each of my books to show while I talk; a snack bar just in case I get hungry; common medicines I might need in case I get a headache or something. I usually add bottled water the morning when I leave. OK, I go overboard. But I’ve been places where I got a headache and didn’t have medicine and I don’t like it. I go prepared! This time, I checked my bag and the Powerpoint CD was missing. I searched, but ultimately had to burn a new CD. Had I not checked, the school visit would have been disastrous. I also do MapQuest or Google Maps and PRINT IT OUT. I’m direction-challenged and follow these type maps to the letter, so it’s essential when I’m driving to have this. If I’m flying somewhere, I double check reservations a week ahead. I try to have contact numbers while traveling; a school number isn’t enough, since travel may be after or before hours. I usually like a cell phone number of the person in charge of the event; likewise, I give them my number, so they can contact me for any reason. If I’m speaking at a conference, I try to have handouts ready a couple weeks early. Which means my presentations are ready ahead of time and I can go over it. Often I read mss from writers attending. I read these carefully, make notes, and often re-read on the plane to an event, as well as referring to them privately in-between sessions. I want to be helpful to the writers and that means I need to be familiar with their work. Most events go well because I try to communicate early, often and clearly, I try to help the organizers to prepare the audience ahead of the event, and I try to be prepared myself. I love to travel and speak.